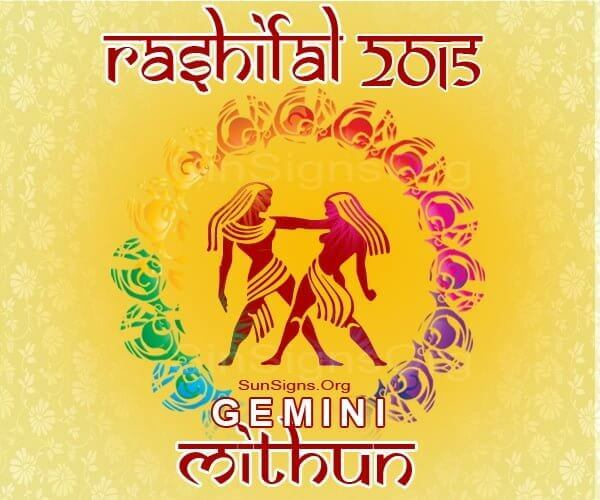 Mithun Rashi 2015 predictions foresee an extremely good year because of favorable planetary positions. All your projects will be successful. Socially you will be recognized and rewarded for your achievements. You can expect success on whatever you lay hands on during the year. Second half of 2015 may pose some minor hiccups for the Mithuna Rasi people, but they will vanish in due course. Overall, 2015 Rashifal predicts that this will be a good year in all aspects of your life. Career astrology predictions by the Mithuna Rashiphal 2015 forecast an excellent year. If you want to change your job for better prospects, year 2015 will provide you good opportunities. Though businessmen will have to strive hard to achieve their objectives, final result will be gratifying. Gemini zodiac sign professionals can expect further growth with promotions. Finances will be excellent. This is the right time to start saving for the future. The 2015 Mithun Rashi forecasts predict that students will achieve excellence in their respective fields. The 2015 Chinese horoscope too will give you an insight into the coming year. On the family front, health problems are a probability for parents of Mithuna Rashi natives. Be prepared for confrontation with a close friend or relative. Do not let silly confrontations spoil your relationships. The 2015 Mithuna Rasi horoscope predicts that this may leave a bitter taste and disrupt harmony in relationships. Singles looking for romantic alliances will have many opportunities throughout the year. Travel for fun and pleasure is on the cards for the Mithuna Rasi natives in 2015. Career related travel will prove to be fruitful. 2015 Bhavishya Rasi foretells that health will be excellent throughout the year for Mithun Rasi. It will be wise to stick to your regular regime of diet and physical training to remain fit. The Mithuna Rashi 2015 predictions forecast that all nagging ailments will either be cured or the intensity will reduce considerably.